Fabricio Werdum shocked the mixed martial arts world when he submitted Fedor Emelianenko earlier this summer. 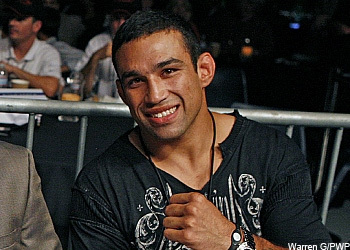 While the Russian can’t get the nightmare out of his head fast enough, Werdum can’t seem to get enough. Even if he’s forced to watch the replay by himself inside the HP Pavilion in San Jose, California. “Fabricio Werdum: Live The Moment” is the third installment of Paul Heyman’s highly popular vignettes for “EA Sports MMA.” The latest video features Werdum admiring his upset special of the world’s former/current top heavyweight, while mowing down a tub of popcorn. EA Sports acquired Heyman’s services to produce five promos for their much anticipated video game, which hits shelves on October 19th. The debut episode was released last Friday starring Strikeforce welterweight champ Nick Diaz. His second masterpiece was released earlier this week and showcased MMA pioneer Frank Shamrock.